In the exhibition, Torcitura, consisting of one large, site-specific work, Angelo di Petta has taken ideas expressed in his recent sculptures and vessels and responded to possibilities and limitations of a gallery space. 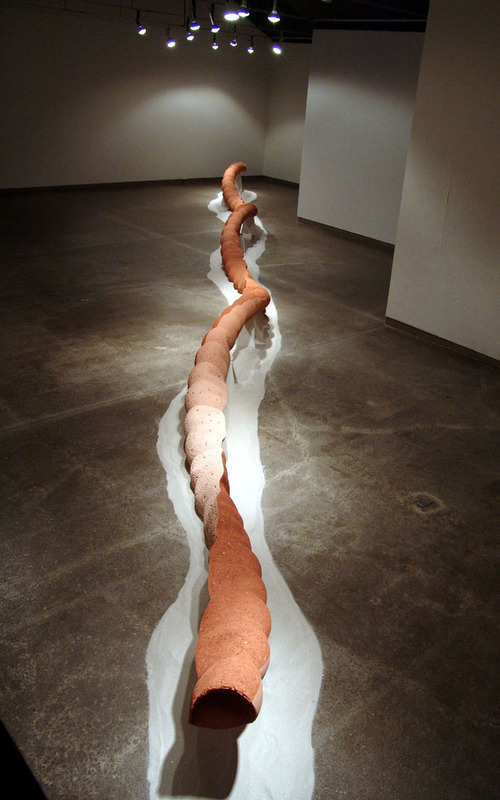 He has created a work that is a fifty foot long, thin ceramic form, essentially straight, horizontal and low to the floor but twisting and rising along its length. It is hollow, as indicated by its two open ends and by small cutouts scattered throughout. It has the appearance of wear or erosion, leaving one to imagine that it might have been a fragment or skin shed by some indecipherable forsaken being of long ago. Continuing in the current of his previous work, recent work, di Petta has created an abstract form with the illusion that the piece is an outcome of a natural process occurring over time. The form of this piece was inspired by the particular shape of the gallery and its varying viewpoints. The first glimpse of it is through an opening on the entrance level. Next, one views it along its length through another opening while descending the ramp leading into the gallery. From this viewpoint the impression is of a static but slightly curving line resting on the floor. As the ramp turns, one sees it again through the same opening, but lower and closer, and upon entering the gallery at the bottom one confronts it at midpoint across its length. At this point one’s perception changes from seeing it as a static line to seeing it as a pulsating object, an abstract form that seems to lift and move, barely touching the concrete floor while creeping along it, fixed in a moment of time. Stretching almost the full length of the gallery from corner to corner, the undulating form counterpoints the sharp geometry of the back walls and ceiling, rising and falling like a wave. On close viewing, one becomes aware of the multitude of details. A sharp edge runs noticeably along the length of it, slowly spiraling around the circumference. One becomes aware that in cross-section the piece is shaped like a teardrop that rotates along its length. One half of the teardrop is roughly textured; the other is relatively smooth. The textured side is a solid mass interspersed with what could be imagined as embedded fossils, tiny spiral shapes appearing randomly and flattened against the surface. 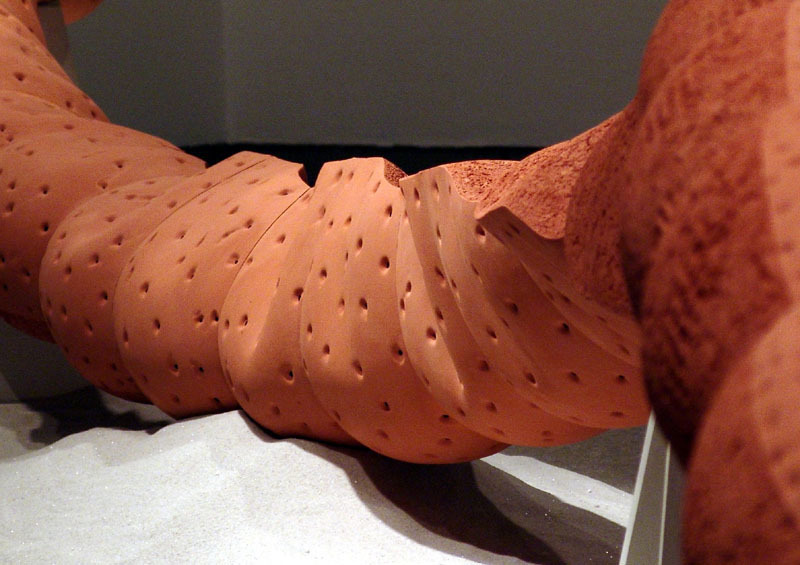 The smoother side is punctured with small, scattered, freeform holes, revealing the hollowness. This balance of textures sets up a subtle contrast; the soft, natural colour of the clay fades in and out from terracotta to soft white. All of these elements contribute to the feeling of nature’s natural erosion. Complex technical skills have gone into the making of a work that so deceptively alludes to the slow workings of nature. Common to all of di Petta’s work is his “problem-solving” approach; first, the visualizing of a piece in its final form, and then the process of figuring out how to actually construct it. This piece is an assemblage of a multitude of single units joined together. Each unit is constructed by uniting seamlessly, in a plaster mold, a combination of slip-cast clay on one half of the unit and press-molded, sawdust-filled clay on the other. The two ends of each unit are so calculated that when the units are joined they do not produce a straight line, but a gently spiraling curve. The textures and openings are a result of the use of two types of clay, and by the final step of sandblasting each unit after firing which smoothes the holes in the slip-cast side. Each individual unit is carefully designed so that the seam produced by joining, while not hidden, has minimal visual effect. The result is not an image of individual units but of one long continuous whole. Di Petta continues in this work with his essential and ongoing ideas of the reciprocal process between nature and art, observing and stealing nature’s patterns and processes. Nevertheless, there is a huge difference between this work and the small works of the past year in terms of scale and intent. Here, the artistic problem was to place a sculpture in a specific space with its own unique architectural qualities. The sculpture is an answer to the demands of the space. Di Petta’s approach to making art is similar, in fact, to the way an architect must work. A building design is a solution to a set of needs and problems, a solution that must unite engineering skills and aesthetic values. The unbroken, harmonious rhythm of the sculpture, the gradation from the simplicity of the overall form to the complexity of detail, the implied movement that is both even and directionless, the diagonal placement in the gallery – all of these could be called the architectural elements of the work. They exist and they do because they are a response to the unique qualities of the gallery space. At points where the sculpture rises and curves it does so because it seems as if it’s being invisibly pushed in that direction by the jutting walls. In the end, the enigmatic nature of de Petta’s sculpture leaves us with both a sense of inevitability and a sense of mystery. Joan McNeil is a ceramicist with a studio in Toronto where she has been making functional ceramics and sculpture for ten years. She has worked as an architect and has taught at the Nova Scotia College of Art, University of Calgary and the Alberta College of Art. McNeil has a degree in architecture from the University of Manitoba and an MFA in ceramics from the University of Regina.